Liberals, climate change activists, academia nerds—unite! 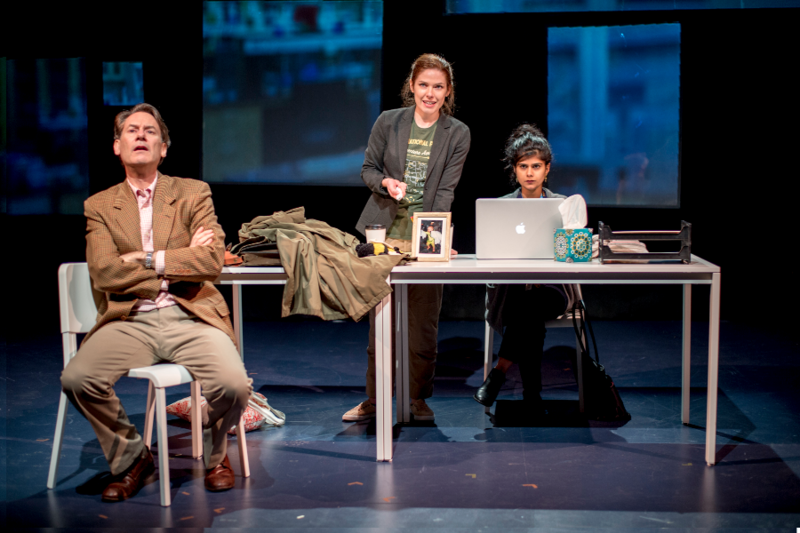 L-R: Ezra Barnes, Rachel Rhodes-Devey, and Mahima Saigal in Queen. Photo by Michael R. Dekker. BOTTOM LINE: Two scientists are faced with an ethical conundrum to best support and save their integrity and the world at large. It’s good to be the Queen. At least it was, before corporations and their chemicals threatened the existence of queen bees and their colonies. In Madhuri Shekar’s Queen, two female academics are determined to expose these toxic truths, defying gender and age stereotypes by thriving in a field with a notorious lack of young women. Research scientists Sanam (Mahima Saigal) and Ariel (Rachel Rhodes-Devey) are on the brink of publishing a groundbreaking paper, which has the potential to bring down an evil corporate leviathan and save the agricultural future of the world. Unfortunately, when their latest set of data undermines their entire project, they are faced with a dilemma of choosing between ethics and virtue. Shekar excels in crafting rich and complex characters. Ariel’s status as a single mother vacillates between pride and exhaustion, while her seemingly woke male mentor (played by a wonderful Ezra Barnes) lifts her up while laying out ways to take her down. Wonderfully interspersed between urgent scenes of ecological crisis are quirky dating hijinks with a Wall Street trader named Arvind, played as a wonderfully deplorable foil by Kabir Chopra. The infusion of traditional Indian expectations of marriage deeply enriches the character of Sanam, allowing Saigal an extra layer of depth for her already brilliant and resilient scientist. Shekar also tackles the weighty topic of colony collapse disorder in an approachable way, making it clear to any layman the invaluable importance of honeybees to all living populations. Unfortunately, the environmental argument against pesticides becomes pounded so hard in lengthy arguments that it begins to feel less like passion and more like pedagogy. Although there are a number of captivating scenes, the production feels like it would benefit from a little more time and editing so that it might truly flourish into its full potential. Staged in a thrust but often acted as a proscenium, actors frequently upstage themselves making it difficult for audience members on all sides to follow their actions. Disconnected projections portray the settings, and are arranged in a way that mirror the perspective of a bee in a hive. While creative, the unfocused and blurry quality of the images can become a distraction, particularly when projections move during dialogue. Like the path of Sanam and Ariel, the production is still finding its way to fully ensconce their Queen to her rightful position. Queen is by Madhuri Shekar. Directed by J. Mehr Kaur. Set Design by Susannah Hyde. Prop Design by Rachel Langley. Lighting Design by Shelby Loera. Assistant Lighting Design by Austin Boyle. Costume Design by Caitlin Cisek. Sound Design by Margaret Montagna. Production Manager is W. Alan Waters. Production Stage Manager is Elliott Karliner. Assistant Stage Manager is Jack Asitimbay. The cast is Ezra Barnes, Kabir Chopra, Rachel Rhodes-Devey, and Mahima Saigal.